What started in Week One was just another solid performance by Minnesota Vikings wide receiver Adam Thielen with a 100-yard receiving outing. Then, it happened again, again and again until it became a paramount moment for the NFL Regional Combine pioneer as he cemented his name into the NFL record book in Week Eight. Thielen is now in rare air as he broke a long-standing record set by former wide receiver Charley Hennigan (Houston Oilers, now Tennessee Titans) in 1961 of receiving 100-plus yards in the first seven games to start a season. Thielen expanded the streak to eight as he caught all seven of his targets for 103 yards against the New Orleans Saints. The once undrafted free agent managed to accomplish something high draftees were unable to do for decades. The receiving yards did not come easy for Thielen as he is double-teamed often. However, the disciplined receiver finds ways to make plays when the Vikings need them. And one catch, in particular, against the Saints was a great example. In the first quarter with 6:23 on the clock, the Vikings faced third-and-5 from the Saints’ 49-yard line. Vikings quarterback Kirk Cousins took the snap from shotgun, looked to his right and tossed a short pass to Thielen. While the ball was in flight, Thielen jumped and caught the ball off Saints cornerback P. J. Williams’ back for 14 yards. Due to the outcome of the game, Thielen probably would trade the record for a win. Thielen rushed the ball for 15 yards and was able to haul in his sixth touchdown of the season. He leads the league in receptions (74) and receiving yards (925). Along with Vikings fullback C.J. Ham, they were the first tandem from the NFL Regional Combine platform to have a carry in the same game. Despite Thielen’s fumble against the Saints, his team has high regards for him. Now since receiver wide Amari Cooper is in Dallas with the Cowboys, it means only one thing for Oakland Raiders receiver Seth Roberts – more opportunities. Two seasons ago, Roberts was one of Raiders quarterback Derek Carr’s favorite targets. With new faces and having the urgency of getting highly profiled receivers involved, Roberts was not targeted as much, and a few drops here and there did not help. Against the Colts, Roberts and Carr were on the same page, especially for one execution. With 12:01 remaining in the first half on the Colts’ 31-yard line, Carr took the snap from center. Carr threw deep down the field to Roberts as he blew pass RC standout Kenny Moore II for an easy 31-yard touchdown. That score marked Roberts’s second touchdown of the season and 13th of his career, giving him sole possession of the second-most touchdowns by an undrafted free agent in franchise history. Roberts finished the game with two receptions for 42 yards. Moore finished the contest with three tackles. Jets linebacker Brandon Copeland has been a quiet monster this season as he displays the ability of getting to the quarterback. And Bears quarterback Mitch Trubisky felt his wrath in the first quarter with 8:47 left. On third-and-3 from the Jets’ 21-yard line, Trubisky was in shotgun formation and tried to escape from Copeland’s pressure, but he could not get away. Copeland sacked Trubisky for a one-yard loss and tracked down two more tackles. The bear in the middle for the Bears is defensive tackle Roy Robertson-Harris. He was on a rampage for four tackles. The Arizona Cardinals badly needed a win at home, and since the offense is still working things out, the defense had to lead the way. Cardinals defensive end Benson Mayowa answered the call and played out of his mind as an unstoppable force. Entering the contest, Pro Football Focus had Mayowa’s pass rushing grade at 70.5, which is higher than the more notable defensive end Chandler Jones. Mayowa went on a terror as he registered five tackles and affected many other plays. 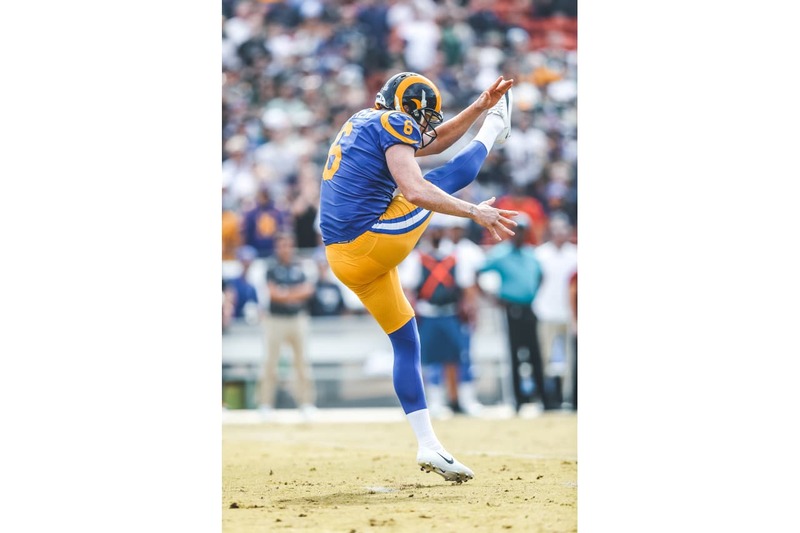 -The kicking specialists were special for their clubs in Week Eight as Johnny Hekker (Los Angeles Rams) and Jordan Berry (Pittsburgh Steelers) made life difficult for opposing offenses, pinning them deep in their territories during critical situations. Hekker had seven punts and nailed three inside the 20. The former high school quarterback went back to his roots and threw a 12-yard pass to cornerback Sam Shields on a fake punt with 8:29 left in the first half. Berry was solid as he nailed two of his four attempts inside the 20. -Cincinnati Bengals tight end Matt Lengel caught his first pass of the season. On second-and-3 from the Bengals’ 35-yard line, Bengals quarterback Andy Dalton threw a short pass to the right for Lengel spanning four yards. -Miami Dolphins defensive end Jonathan Woodard continues to be extremely active with a recorded a tackle.